The other day, one of my many jobs sent me to Nederland, TX, which is about two hours east of the part of Houston in which I live. I needed to be in Nederland for a grand total of two and a half hours. Crazy, right? I drove a total of four hours for a job that lasted fewer than three! Suffice it to say, I felt the need to justify all that driving with a bit of fun, and I wound up driving an extra 20 minutes east so that I could visit McFaddin Beach (and I highly recommend you click that link, because the article is EXTREMELY worthy of note, especially if you are interested in finding fossils on a beach). McFaddin Beach, also known as the McFaddin National Wildlife Refuge, was on fire last time I passed it by. Mom (known more commonly here as Jody) and I tried to visit Sea Rim State Park on our way to Louisiana last summer, and we didn’t make it very far because there was an extremely smoky brush fire raging there. McFaddin is immediately past Sea Rim State Park on the same road, and I am happy to report that it was absolutely fire-free this time around. In fact, I had the great good fortune to enjoy it on a truly beautiful day! I was at first disappointed that I arrived at high tide (the water was all the way up to the knee-high, three-yard-wide pile of seaweed that separates the parking area from the water), but over the course of the two or three hours I wandered there, the tide receded somewhat, and I found a startling array of truly remarkable shells! I found no fewer than nine whole and completely undamaged angel wings, two brightly colored and unoccupied shark-eye snail shells, and some very nice whelk pieces, among other things. 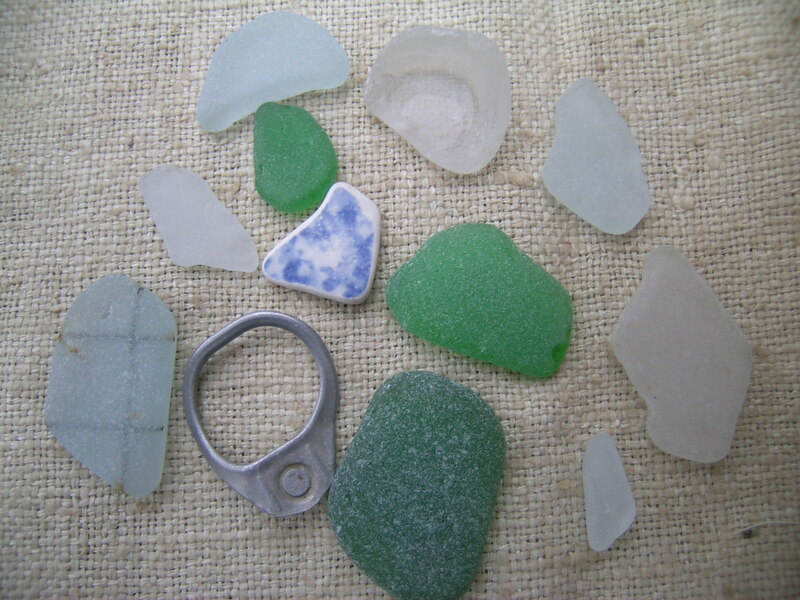 I even found a very nice piece of green sea glass. While I wandered, I passed kids playing in the silt, a good number of adults wading, swimming, and sun bathing, and an older gentleman searching the beach with his metal detector. I watched whole flying and floating flocks of some sort of very large bird I never managed to identify. I discovered a weathered coconut, looking rather lonely and a bit out of place on a Texas beach. I startled a few ghost crabs back into their holes, and I returned a couple of beached, live snails to the water (those were actually before I discovered the two unoccupied shells). I will say, though, that I did not pass anything at all along the lines of bathroom facilities, showers, or lifeguard towers. If you plan to visit McFaddin beach (and if you happen to be anywhere near Port Arthur, you really should), bring a jug of water to rinse your feet off and go to the bathroom before leaving town! 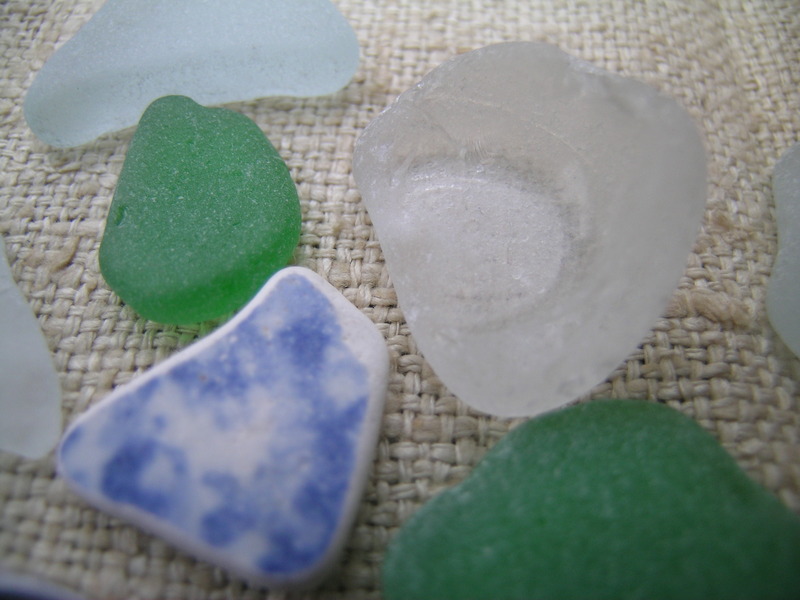 While you’re at it, I recommend that you pack a picnic, sun block, a hat, and an extra large bag in which to stow your shelling treasures. You’re in for a fun and productive day at the beach! Fun stuff! Have a great day, hopefully at the beach. -E.G.D.